The following is a position paper I developed for a panel discussion on games as tools for public history presentation and interpretation. I thought I would share it here for further discussion and comment. Panelists were asked to consider a series of questions, I’ve picked these two to serve as prompts for reflecting about games as a mode for presenting historical interpretation. First, “How can historical sites get game designs that are more interactive and narrative-driven, more grounded in the contingencies of history?” and second, “How can we design games that engage the visitor/student without reducing complex historical processes to a simple adventure story, or complex historical figures to one-dimensional heroes or villains?” In both cases, I think the challenge to historians is to let go of narrative and start by asking themselves different kinds of questions. Questions like, what are the interesting decisions we should present a player? Or, how would one model the forces at play in a given historical incident or moment? There is an explicit tension between composing traditional historical narrative and presenting complexity and contingency. Historical writing creates and presents stories, largely through linear and chronological text. Instead of scripting out a story games enable historians to map out decisions and relationships as models which can in turn create possibility spaces in which players generate narrative through interacting with models that can be created to surface and feature complexity and contingency. That is, to think far more about the individual decisions, the available actions, and the discrete unit operations that come together to enable the generation of narrative in game play. I think the challenge is to think about designing systems, about designing mechanisms, and not about plotting out stories. I will briefly talk through how they play out in a rather straightforward simple flash game created nearly a decade ago. Jamestown Adventure falls just slightly on the side of actually being a game, being somewhat of a digital Choose-your-own-Adventure. 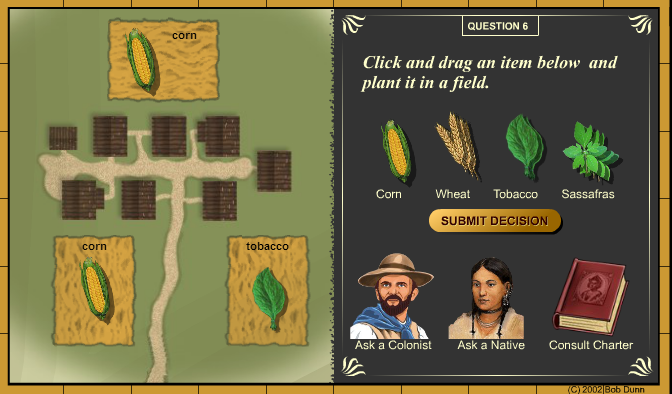 Created over a decade ago, in 2002, this small Flash game you get to make a series of decisions, posed as questions, about colonizing Jamestown. Each question embodies a different part of a model for understanding Jamestown. You are asked where to land, how to interact with natives, how to allocate your colonists time between hunting, fishing and looking for gold, and what crops to plant. At each step in the decision process, you have the opportunity to ask a colonist, talk to a native, or consult the primary source, (the text of the town charter). At the end of the game you get a quick report on how your colony fared in terms of health, wealth, food supply, and morale. The report gives you a sense of what actually happened and provides a comparison of your decisions with those of the actual colonists. You end up finding out if you did better or worse than the Colonists. The whole game takes about ten to twenty minutes to play, making it work great for a classroom activity.The game is straightforward, but in it’s simplicity it incorporates some really valuable properties. Here are a few different components of a very simple game that I think are powerful values for thinking about designing games for public history. The game is entirely about meaningful player decisions: The mechanics of the game are very simple, it’s basically an animated chose your own adventure. Importantly, it doesn’t attempt to bolt on a rhythm game, or a shooter game, or some kind of interaction. It simply presents a set of decisions for a player to make and takes you to the resulting outcomes. While a game like Sid Meier’s Civilization brings together much more sophisticated means of simulating and presenting a model of the past, even something as simple as this choose your own adventure style game is potent in modeling the contingency and complexity of the past. The decisions model interrelated historical forces: Deciding how to organize labor, what to plant, where to establish the colony, and how to interact with natives bring to the foreground the extent to which social policy, culture, geography, and economics interact to create different historical situations and outcomes. In short, the decisions the player is presented with clearly bring to the foreground distinct and interrelated forces that shape how history unfolds. Primary sources are ready-at-hand resources: You do better at the game if you click to consult the charter, which shows highlighted relevant parts of the document to you. At any moment a player can decide to take a look and see if actual historical records offer insight into making better decisions. This is how the game overcomes the limitations of counterfactuality. The historical record is itself a resource for toying with the model of the game. Distinct historical actors present competing situated perspectives on the best course of action: The straightforward ability to consult different individuals who represent different historical perspectives gets you to think about different perspectives and evaluate those perspectives in making decisions in the game. Players decide when the perspective of a native or a colonist might help them make better decisions. At each decision point the colonist and the native and the charter present distinct and conflicting information on what the best course of action is and the player is poised to chose whose advice they value for a given decision. Potential for transgressive play: Players are welcome to make terrible decisions. They are free to toy with the model and see if you can get all of the colonists killed. Just take a look at what happens when you decide to not plant any crops and build a stone fortress. Similarly, players are encouraged to try and do better than the original Jamestown colonists. In both cases, the game presents a range of possible outcomes and encourages a player to probe and explore them. Model exploration enables replay value: You play through, you see the result, you want to go back and see if you can do it even better. Each play through gives you a chance to think through different scenarios and compare them to the actual past. 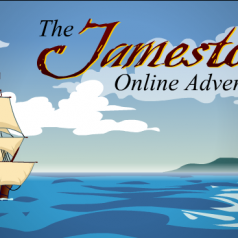 As you probe the (rather simple) counterfactual model of the game you gain an appreciation for the social, economic and agricultural forces that the game’s authors think are most important to understanding the possibilities of Jamestown. What makes both of these games useful is that they present relatively simple models. They are effectively little montessori toys that you can manipulate and explore. While they are both rather simple their simplicity obscures that they represent a very different way of thinking about the past. Instead of starting with a story to tell, a sequence, or a chronology, this game’s genesis lies in the development of a simple model, a system that one manipulates and through manipulation produces a narrative, and unfolding of a particular circumstance. I think the trick for historians and public history professionals interested in designing games is that they need to think about defining units and operations that create systems filled with interesting decisions. Whether it be these small interactives or massive games like Civilization, I think the most exciting possibilities for the future of games for history exists in changing one’s frame of mind away from thinking about retelling stories and instead to focus on building models that people can play with. I think it’s a delicate balance between narrative and, what you might call, contingency systems. A game that is too close to the historical narrative is little better than a textbook or monograph with great visuals. Even if the narrative in this sort of game is fantastic, the game will be boring because you’re merely reliving, or replaying as it were, the historical record verbatim. If a game is not fun, then it’s not worthwhile. Contingency systems add a great deal of fun and replayability, but you have to be careful because if there’s too much contingency then it can defeat the educational purpose of the historical setting or narrative. Perhaps it’s enough that a player is exposed to the history, even if they only spend their time in transgressive play. I think you see a lot of this tension in modding for games like Civilization. On the one hand, you have mod or scenario builders that cleave closely to the historical record – the type of mods that name specific units and force the player to follow a particular chronology. On the other hand, you have mods and scenarios that keep a historical setting but throw out all the rules. Both types of modding are popular, but they are for different groups of players. One idea would be to develop a game that required the player to complete a limited playthrough (that held the historical record close) before they could unlock contingency systems. This would allow the designer to deliver their narrative before allowing the player to enter the sandbox.